We specialize in the foodservice industry. 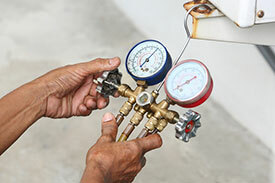 • HVAC, Refrigeration Service and Installation. • We have 24 Hour Emergency Service. • Live After Hours Answering Service. Every business relies on heating and air to provide a comfortable environment for both their employees and clients. When a unit fails, overall productivity and sales can alter dramatically. For over 20 years ACF Services has provided the Louisville, Kentucky, region with a fully licensed and insured service and installations of commercial and industrial units to help in producing the best environmental conditions to conduct business. ACF Services also maintains and installs various refrigeration and ice-making units. We even service and install various walk-in coolers for the food service industry. So whether you need HVAC or refrigeration installation or repair at your place of business, ACF Services is a phone call away in providing the highest quality in service and satisfaction. Here is a few of the lines we service. We are the preferred service company for True Manufacturing. Here is a few of the lines we service and install. We are factory authorized. We service and install commercial water filter systems.